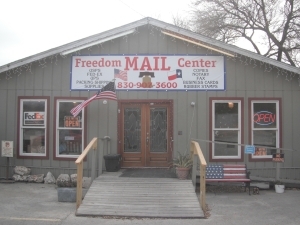 Welcome to Freedom MAIL Center, the most trusted shipping, personal mailbox and mail supply center to cater to the Canyon Lake, TX area and across the country. Here at Freedom MAIL Center we have a passion for what we do. With our Customer First approach we give you the Freedom of convenience. Begin Saving Time and Money Now! Life is too short to wait in line. With our experienced professionals we get you in and out while servicing all your mailing and supply needs. We are open Monday – Friday, 8:30 A.M. – 5:30 P.M.